Water is the most essential thing our body needs and getting access to clean water is very important especially for outdoor activities. Because of this, we researched the best water bottle with filter on the market today. There are many to choose from but only a few really do their purpose effectively. Why do you need to find the self filtering water bottle? Outdoor water from streams, rivers, or lakes contains many chemicals and bacteria that can be harmful to the body. These can cause illnesses and can even be potentially deadly. Using a filtered water bottle will remove most of these and make it safe to consume. Now, let’s check out which are the best self filtering water bottle you should be buying. How Much Can It Filter? 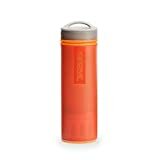 This ultralight version of Grayl is an ideal accompaniment to your outdoor activity because it only weighs 10.9 ounces, which is around half the weight of the stainless steel version - Grayl Legend Trail Water Filter Bottle. Despite the decrease in weight, it performs excellently and is very easy to use for survival. Filtering out impurities doesn’t require batteries and will take effect in 15 seconds after a simple press of the button. It is known to filter water from particles, chemicals, heavy metals, and even 99.9999% of disease-causing bacteria and viruses. There is no aftertaste and odors, plus it improves the water clarity. Grayl filters combine 3-stage technologies to effectively clean the water and has been proven safe and effective by many adventurers. Also buy the bottle for a good cause, Grayl is a member of 1% for the Planet and donates a portion from each sale. What’s more, a single purifier cartridge can displaces 300 single-use plastic bottles, therefore lessening the landfill too. If you are looking for the stainless steel version bottle, check out the stainless steel Grayl Legend Trail Water Filter Bottle, here. The Woder Survival Water Filter Bottle looks like a normal water tumbler, but what sets it apart is the ionic absorption filtration system it uses to remove contaminants and impurities from outdoor water sources. It’s very easy to bring and attach to your bag with a clip hook. This 24 oz bottle can help keep you safe when you drink because effectively removes dirt and bacteria, but leaves minerals like calcium, magnesium, and potassium which are beneficial to your health. The filtration system is approved and tested, and abides by ANSI/NSF Protocol for Standard 42 and 53 Class﻿ I adapted for sport bottles and it is one of the best filtered water bottle with very good ratings and many satisfied buyers. The filter takes away up to 99.99% of toxins, bacteria, and viruses, and can take up to 145 refills or 25 gallons of water from common outdoor sources. It’s compact enough to fit in your backpack and one of the best water bottle with filter for travel. Other than that, the bottle is BPA free, ensuring your maximum safety in using this product. This filtered water bottle was made in the US. 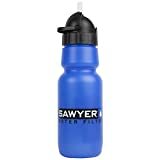 This Sawyer Water Bottle with Filter is another excellent water bottle with filter to bring on your hike or to be used for emergency. This also has a very simple and straightforward 34 oz tumbler design but effectively cleans your water for safe consumption. It has a 0.1-micron filter with a hollow fiber membrane, which makes it very effective in filtering out most of the dangerous bacteria, viruses, and toxins that are harmful to the body, up to 99.9999% as well. With this bottle, you are sure that you have one of the highest portable water filtration systems. The bottle is designed to have a high flow rate, providing you with clean water faster. The bottle set includes 63mm cap, a backwash syringe, and 2 replacement straws, definitely more than you can ask for. With a weight of 5.5 ounces, this BPA-free bottle can provide convenience in making your water safe. 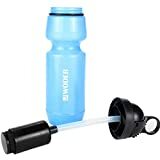 We go through hundreds of products listing at Amazon and also study the ratings left by previous buyers to find the best water bottle with filter for you. Besides that, we also calculate the overall net ﻿﻿﻿customer satisfaction (NCS) grade because we want to see how happy is the previous buyers with their purchase of the product. From our finding, we can say that GRAYL, Woder and Sawyer Products are the best water bottle with filter brands. These brands are popular and received many excellent ratings for their products. Also, the GRAYL Ultralight Water Purifier, Woder 24-Sur Survival Water Filter Bottle and Sawyer Products Personal Water Bottle Filter score favorably for the ratings as well as the NCS grade compare to the rest. We believe that you would find these filtered water bottles a good buy too. When buying the best filtered water bottle, here are a few considerations you need to know. These will make sure that you get a water bottle with the most important features needed to filter water. Most water bottles with filter are made of plastic so that they can easily be brought along, although there are also bottles made of stainless-stee﻿﻿﻿l. A lot of people who use filtered water bottles are traveler or adventurers, so they need something made with lightweight material like plastic. When a product is made of plastic, remember that it should be BPA-free. This is the main reason for buying a filtered water bottle so pay close attention to what components it can remove from the water. Common bacteria found in the stream are like Giardia lamblia, Cryptosporidium and E. coli. Making sure the filter can filter out these bacteria is essential to keep you safe from drinking the water. Living organisms like bacteria and parasites are present in outdoor water. Some of these are harmless, but there are those that can pose risks and cause gastrointestinal problems like vomiting and diarrhea. An example is Cryptosporidium or Clostridium. Filters that have 1 micron or less can remove these. Chemicals can also be found in water. These can be organic (pesticides and disinfectants) or inorganic (chlorine, arsenic, fluoride or copper) compounds that can find its way into the water and contaminate it. Viruses are a lot smaller than bacteria, even 1/100 their size. So, it is important to consider a filter that has the smallest micron size to successfully remove these very tiny organisms. Another thing to consider is how many refills can a filter last for. Some can only be used up to 150 times and become ineffective after that. So, before purchasing, make sure to pay attention to the number of refills the water bottle can take. Most filtered water bottles can be used with any type of outdoor water. These are portable tumblers that have a filtering system for safe water consumption during outdoor activities. Despite this, you should check what kind of water the bottle is designed for. Some bottles are not to be used with salt water, though. There are two types of filters commonly used in water bottles which can be combined to be a more powerful system to remove contaminants. Carbon filters are made of an activated carbon layer which water passes through in the bottle. Along the way, contaminants are removed and filtered out to small sizes. Eventually, filters of this type wear out and need to be replaced. With the guide that we made, choosing the best water bottle with filter is now easier. Our top chosen bottles can help you enjoy safe and clean water on your adventurous activity. You don’t have to worry about consuming dirty water because getting it clean is now more convenient. Other than that, a reusable bottle is better for the environment. Of course, each bottle has its own unique features so you’d have to work out what the best for you. Refer our buying guide so that you can carefully pick out the perfect one for your needs. There are so many options out there but the ones we included in our list are worth buying.